Includes Free CD's Of The Entire Box Set! 3x Double Vinyl & 3x CD with the Album, Exclusive remixes, instrumentals and outtakes! 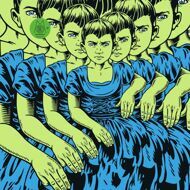 Intent on creating something that contrasted their own individual projects, Moderat — the trio comprised of Gernot Bronsert, Sebastian Szary (aka Modeselektor) and Sascha Ring (aka Apparat) — complete the trilogy with III.